All around the world, lovers have unique ways of showing their affection for one another. 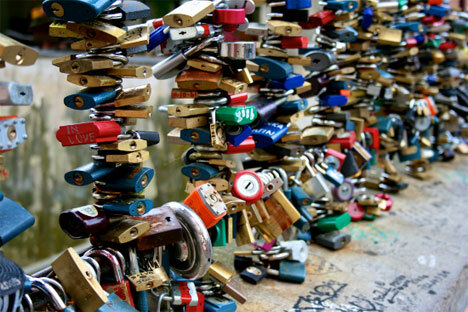 But few are as sweet and enduring as the act of locking a couple’s love with a padlock and throwing away the keys. Love padlocks can be seen adorning walls, fences, chains, bridges and even lampposts throughout much of the world – and each one of them represents the undying adoration of a couple in love. 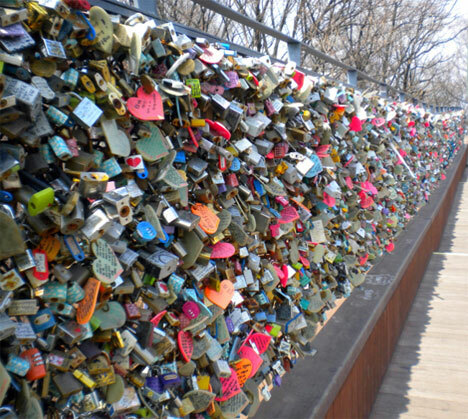 The love lock tradition is thought to have originated in China, where lovers would write their names or initials on a padlock, lock it to a permanent public fixture, and throw the keys into a river so the two lovebirds could never be parted. 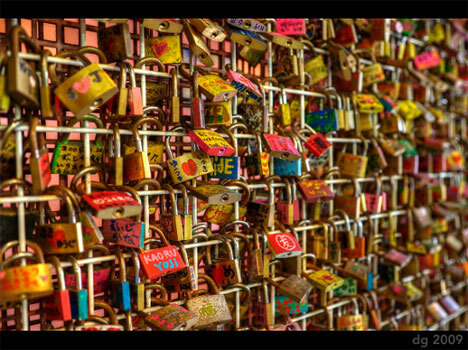 Since the first couple symbolically secured their relationship in this way, other love padlock walls have popped up in cities and towns all over the planet, though most tend to be concentrated in Europe and Asia. 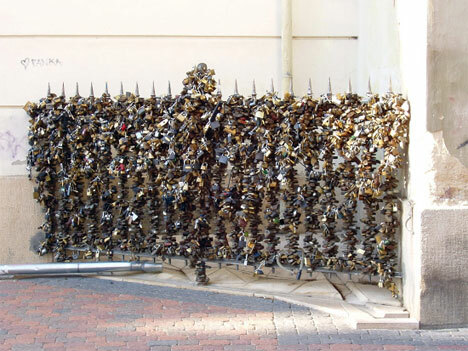 When padlocks began to take over public spots in Pécs, Hungary, the local government was forced to officially designate one specific spot as a “love lock” wall to prevent the locks from taking over the entire city. 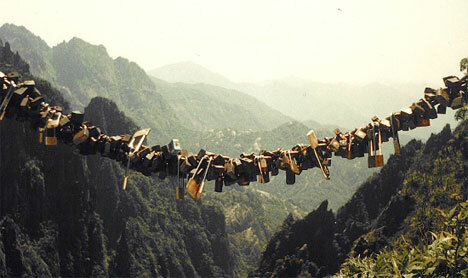 Although the idea behind love locks remains constant, the practice varies from one place to the next. 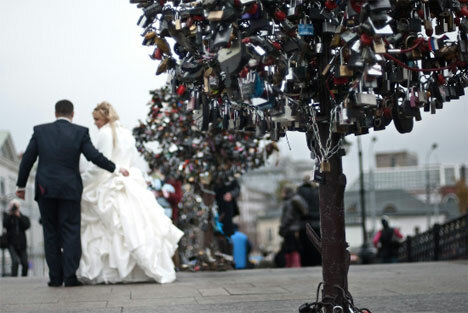 In some countries, love locks are placed by newlyweds on their wedding day to secure their love for a lifetime. 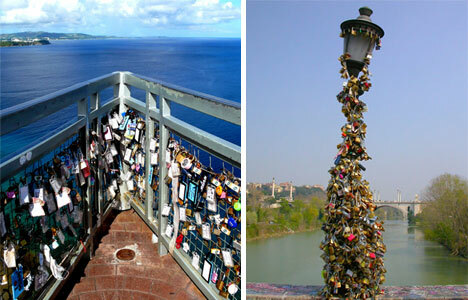 In others, the locks are placed by couples in love (but not necessarily married) to bring good luck to the relationship. Some locations offer bins in which to deposit the keys, while other couples elect to toss their keys into a body of water where they will never be found. 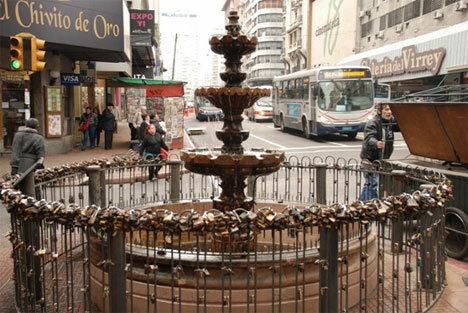 At the above fountain in Montevideo, Uruguay, a plaque encourages lovers to write their initials on a lock and attach it to the fence. According to the legend referenced by the plaque, the lovers will return to the fountain and their love will be sealed forever. The relatively new custom probably originated in the 1980s, though many lock lock locations have only popped up in the last five years. Although local officials in cities which embrace love locks are unfailingly annoyed at the practice, couples don’t seem deterred by this minor detail. They continue to display their fidelity with this adorably amorous habit that binds two souls for life.